I love penguins, they always bring a smile to my face, so, naturally, when I was browsing through the books for sale at my local library and spotted a book with penguins on the cover, I took a closer look. Adult non-fiction? A book about men playing cricket? Even with penguins, it wasn't an obvious choice for me. According to the blurb, the book was a ‘hilarious odyssey in which an amateurish bunch of English eccentrics play cricket across the globe’. I’m a great fan of tv’s ‘Have I Got News For You’, so once I realised that the author, Harry Thompson, was the show's creator, and that Ian Hislop, one of the show's regulars, was also one of the‘eccentrics’, I thought I'd give it a try. 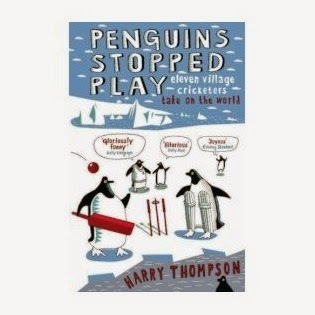 ‘Penguins Stopped Play’ documents the quest of a group of failed cricket players to take a team round the world and play cricket on seven continents. They call themselves the Captain Scott XI, their aim being to lose every game. 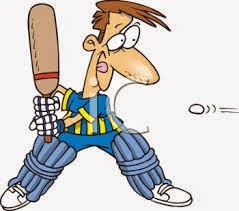 Any batsman who starts to take winning seriously, is deliberately run out. The target is to be out as soon as possible and retire to the pub. For a number of years, the team plays on a UK circuit, against village teams, losing handsomely, before the author comes up with a more ambitious plan: to complete a world tour. His efforts to bring this had me laughing out loud. I loved the jokes and japes, the Blandings-style fixes the team gets into, and I loved the factual stuff, sometimes quite detailed, about the geography and history of the places visited. This book is about blokes at play, blokes with enough leisure time and financial means to go off around the world playing cricket for several weeks, with not a woman in sight. I could easily have missed it and I'm so glad I didn't! I loved it and recommend it as a thoroughly enjoyable read. Thank you, Pauline, because I think you've just solved my what-to-get-him-for-his-birthday dilemma! Exactly the sort of book that needs reviewing because, for all the reasons you give, I would never have picked it up for myself. Thanks,Pippa! I felt a bit guilty about reviewing such a blokey book, but it's such a hoot. Glad it helped with your pressie-buying! Harry Thompson also wrote the novel This Thing of Darkness about Robert Fitzroy and Charles Darwin. It's a wonderful book. So sad that he died - at just 45 - soon after it had been published.